Summary: Kate and her two best friends, Sierra and Alexis, are geared up for a week of fun and freedom on the road to their family lake houses in Love, Wisconsin. Best of all, when Kate reaches Love, she'll be reunited with Lucas, with whom she shared a steamy end-of-summer kiss last year. She can't wait to see Lucas again and pick things up exactly where they left off. My Thoughts: We meet Kate and her best friends Alexis and Sierra. All 3 girls are going on a road trip to Wisconsin to their summer vacation spot! They are meeting up with their parents there!!! They have it all mapped out! Fun, girl time, chatting, etc. There is also Adam, Alexis cousin who Kate can not stand! He is annoying and he bugs her to the extreme!! Kate can't wait to get to Wisconsin to see Lucas, the guy she's been crushing on forever and kissed at the end of last summer!!! 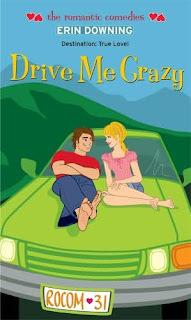 The ride to Wisconsin puts Kate and Adam in a few laughable romantic situations! They all get to Wisconsin, and Kate finally meets up with Lucas, and things aren't what she thought they would be!! She starts to realize that there might be more to Adam than she thought! I liked Adam from the get go! I could see myself falling for him! What happens to Kate and Lucas? Where does Adam come in? This book was really cute and romantic. There were a few parts that had me smiling to myself, saying awwwwww! This is how every girl wants her prince charming! Read this book now, you won't regret it! Overall: I love the Simon Romantic Comedies! I still have a few more to read, but they are just so darn cute and perfect for anyone who likes a fun romance book! I really enjoyed this one! Cover: Its cute! I'm not a big fan of cartoon characters on books, but I still like it! Looks like a fun book. I havent read any other reviews on this one. I should get around to one of these romantic comedies. They all have the cutest covers!